The United States acquired the four corners region from Mexico after the end of the Mexican–American War in 1848. In 1863 Congress created Arizona Territory from the western part of New Mexico Territory. 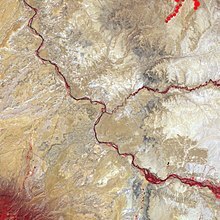 The boundary was defined as a line running due south from the southwest corner of Colorado Territory, which had been created in 1861. This was an unusual act of Congress, which almost always defined the boundaries of new territories as lines of latitude or longitude, or following rivers. By defining one boundary as starting at the corner of another Congress ensured the eventual creation of four states meeting at a point, regardless of the inevitable errors of boundary surveying. The area was first surveyed by the U.S. Government in 1868 as part of an effort to make Colorado Territory into a state, the first of the Four Corners states formed. The first marker was placed at the spot in 1912. The first Navajo tribal government was established in 1923 to regulate an increasing number of oil exploration activities on Navajo land. The Four Corners Monument is located at 36°59′56.3″N 109°02′42.6″W﻿ / ﻿36.998972°N 109.045167°W﻿ / 36.998972; -109.045167Coordinates: 36°59′56.3″N 109°02′42.6″W﻿ / ﻿36.998972°N 109.045167°W﻿ / 36.998972; -109.045167. The Four Corners is part of the high Colorado Plateau. This makes it a center for weather systems, which stabilize on the plateau then proceed eastward through Colorado and into the central states. This weather system creates snow and rain fall over the central United States. 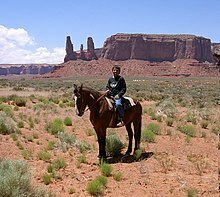 Federally protected areas in the Four Corners area include Canyon de Chelly National Monument, Hovenweep National Monument, Mesa Verde National Park, and Canyons of the Ancients National Monument. Mountain Ranges in the Four Corners include Sleeping Ute Mountains, Abajo Mountains, and the Chuska Mountains. 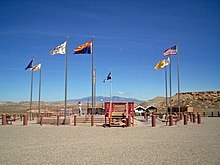 Six governments have jurisdictional boundaries at the Four Corners Monument: the states of Arizona, Colorado, New Mexico, and Utah, as well as the tribal governments of the Navajo Nation and Ute Mountain Ute Tribe. The Four Corners Monument itself is administered by the Navajo Nation Department of Parks and Recreation. Other tribal nations within the Four Corners region include the Hopi and other Ute. The Four Corners is home to the capital of the Navajo tribal government at Window Rock, Arizona. The Ute Mountain Ute Tribal headquarters are located at Towaoc, Colorado. The Four Corners region is mostly rural. The economic hub, largest city, and only metropolitan area in the region is Farmington, New Mexico. The populated settlement closest to the center of Four Corners is Teec Nos Pos, Arizona. Other cities in the region include Cortez and Durango in Colorado; Monticello and Blanding in Utah; Kayenta and Chinle in Arizona; and Shiprock, Aztec, and Bloomfield in New Mexico. Air service is available via the Durango-La Plata County Airport in Durango, Colorado, Four Corners Regional Airport in Farmington, New Mexico, and Cortez Municipal Airport in Cortez, Colorado. Interstate 40 passes along the southern edge of the Four Corners region. The primary U.S. Highways that directly serve the Four Corners include U.S. Route 64, U.S. Route 160 (which serves the Four Corners Monument itself), U.S. Route 163, U.S. Route 191, U.S. Route 491 (previously U.S. Route 666), and U.S. Route 550. The main line of the Atchison, Topeka and Santa Fe Railway, now operated by the BNSF Railway, passes along the southern edge of Four Corners. The area is home to remnants of through railroads that are now heritage railways. 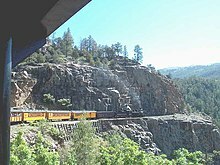 These include the Durango and Silverton Narrow Gauge Railroad and the Cumbres and Toltec Scenic Railroad. The Black Mesa and Lake Powell Railroad, which connects a power plant with a coal mine near Kayenta, comes near the Four Corners. ^ "Four Corners PID AD9256" (text file). NGS Survey Monument Data Sheet. United States National Geodetic Survey. 2003-05-07. Retrieved 2007-01-15. ^ Richard F. Weingroff. "U.S. 666: Beast of a Highway?". (USDOT – FHWA). Retrieved 2007-11-17.